A 57-year-old man has been jailed for 18 months for sending racially-abusive emails to a BBC radio presenter. Phillip Norman pleaded guilty to sending more than 30 messages of an anti-Semitic and abusive nature to BBC WM's Ed Doolan. Norman, from Chapel Lawn, Bucknell, near Church Stretton in Shropshire, sent the e-mails over a two-year period. Sentencing him at Stafford Crown Court, Judge John Shand told the electrical engineer his was a "vicious, spiteful, deliberate and sustained course of conduct". The judge added: "You exceeded even the leniency given in this country to vulgar abuse. "It is plain from the case papers that even experienced public figures such as he would have been distressed - even someone used to the cut and thrust of controversy." Norman had pleaded guilty to one count of racially-aggravated harassment at a hearing last month. Norman's lawyer said his client claimed the messages were intended only as a joke. 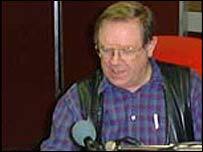 After the hearing Mr Doolan, who has worked for the BBC for more than 30 years, said he was relieved that the ordeal was over. "When you are in a job in the media where you are a commentator people are going to disagree with your views and they are going to disagree with your views quite strongly. "But the fact that I am Jewish and the threats I was receiving, saying that he was monitoring and watching me, were breaking the law and simply went too far," Mr Doolan added.